The men’s World Cup kicked off today in Moscow. Over the course of the next month, billions of people from all over the world will watch the soccer competition. And news organizations, of course, will be offering all sorts of coverage. The Washington Post is no exception. As part of its coverage, it is publishing a daily newsletter recapping all the action and offering insight into the action both on and off the field. But before the Post decided to move forward with the newsletter it wanted to see if it was actually something readers wanted to read. So it created a quick survey asking readers if this was a product they were interested in. This week in Solution Set, we’re looking at how the Post decided to create a pop-up newsletter for The World Cup. I spoke with Tessa Muggeridge, the Post’s newsletter and alerts editor, who shared details about the survey they put out to gauge interest, how they used reader feedback to shape the format of the product, and what they learned from previous pop-up newsletters. “We wanted to use the survey to demonstrate that a really strong audience existed,” Muggeridge told me. Solution Set is a weekly report from The Lenfest Institute for Journalism and the Solutions Journalism Network. Every Thursday, we take an in-depth look at one chic thing in journalism, share lessons and point you toward other useful resources. 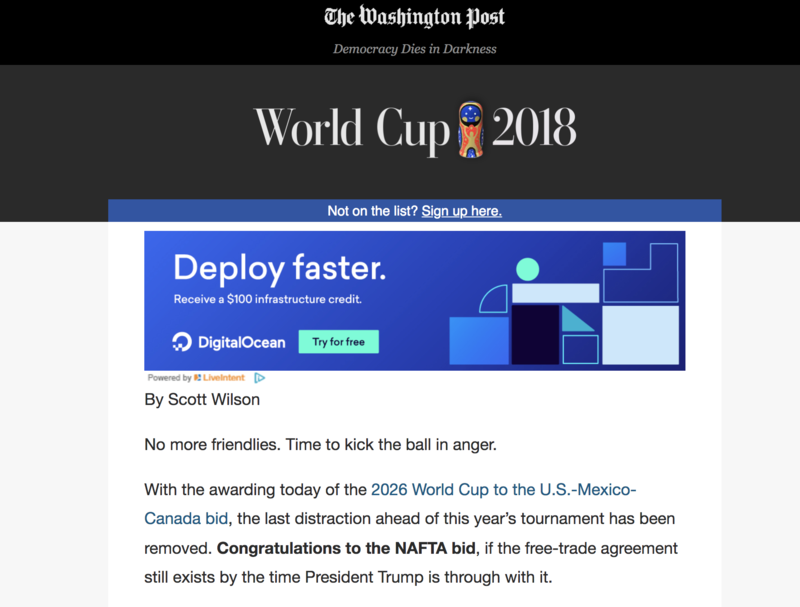 • The Challenge: The Washington Post wanted to launch a pop-up newsletter for the men’s World Cup, but it wanted to make sure that it was something readers wanted. 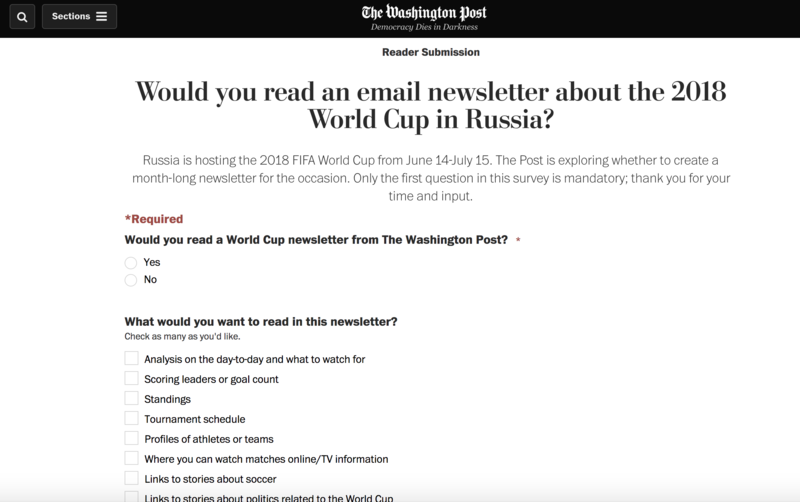 • The Strategy: The Post’s newsletter team put together a short survey asking readers if they would read a World Cup newsletter. • The Numbers: 76 percent of respondents said they wanted a Post World Cup newsletter. • The Lessons: The survey asked about the type of coverage readers wanted, and the Post used that feedback to shape the focus of the coverage. If you’re going to ask readers for their opinions, you should incorporate their feedback into the work. • The Future: The Post hopes the newsletter grows its international audience, and it plans to use this methodology again for future products. Like most news publishers as of late, The Washington Post has been investing heavily in email newsletters, which it sees as a way to reach readers directly and to ultimately convert them into paying subscribers. As it started planning out its coverage of the 2018 men’s World Cup, which kicks off today in Russia, the Post began sketching out the possibility of a newsletter covering the tournament. Muggeridge and her team had several meetings with staffers from both the sports and foreign desks to sketch out what a potential newsletter might look like and the angles they wanted to potentially cover — from the action on the field to the geopolitical implications of staging the tournament in Putin’s Russia. So the Post set out to discover whether this was a product its readers wanted. In late April, about six weeks before the World Cup kicked off, a survey appeared on the Post’s website, and staffers quickly spread it across social media. 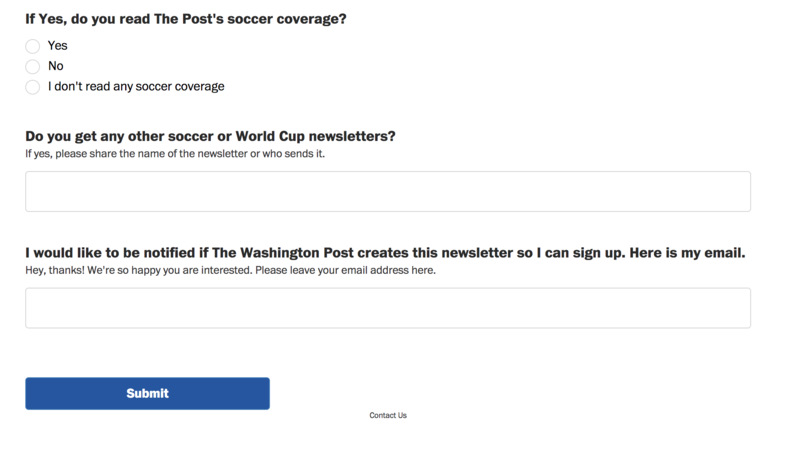 The Post’s newsletters and alerts team had put together a survey in an attempt to gauge interest in a World Cup newsletter. 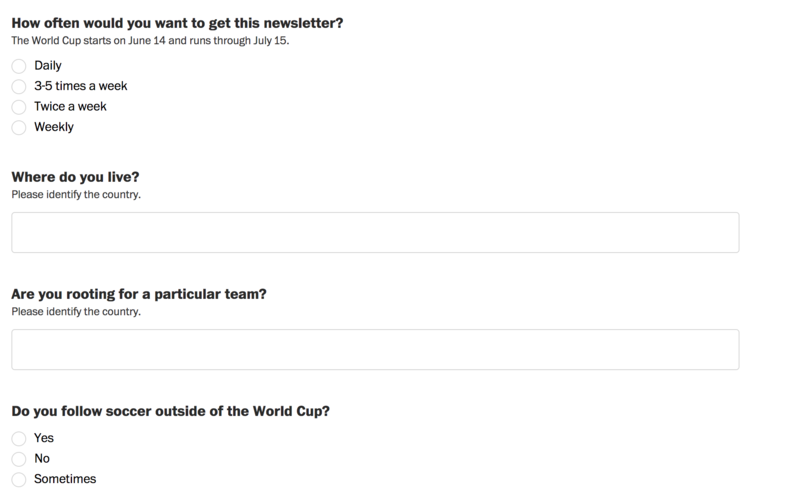 The first question of the survey asked users whether they would read a World Cup newsletter from the Post. That was the only required question in the entire survey. The rest of the questions asked users about which topics they would want a newsletter to cover, how frequently they’d like to receive a newsletter, where they live, which team they’re rooting for, and more details about how and where they consume soccer coverage. It also, importantly, enabled readers to submit their email addresses so they could get notified if the Post decided to launch the newsletter. The Post had previously posted short surveys in newsletters to get feedback on products, but it had never undertaken anything of this scale, Muggeridge said. The publisher also has a formal research department, which it uses to help develop new products. The newsletters team typically works with the research department, but it didn’t think it necessarily made sense with the audience it was seeking for the World Cup newsletter. The Post wanted to try and reach as wide an audience as possible — especially people who weren’t typically Post readers — so it did everything it could to get the word out. The World Cup newsletter survey received “thousands” of responses, Muggeridge said. Seventy-six percent of respondents said they would want to receive the newsletter. With that positive response, the Post decided to move forward with the newsletter. It published its first issue yesterday. “My goal is to provide a daily tip sheet of sorts that appeals to both the soccer die-hard and the casual fan, who knows he or she wants to follow the World Cup but isn’t sure quite what to look for each day,” Wilson wrote in a story introducing the newsletter. “Maybe it’s a player or a particular rivalry or a political moment during a tournament historically famous for them. The Post publishes about 70 total newsletters, Muggeridge said. • Listen to readers: The Post used reader feedback to shape the newsletter. 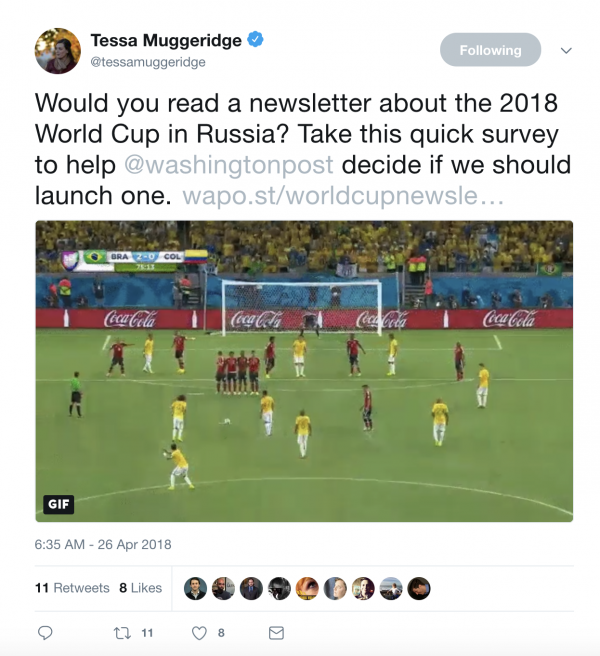 Only the first question of the survey, about whether the user would read a World Cup newsletter from the Post, was required to submit the survey, but about half of respondents took the time to complete the whole thing, Muggeridge said. That added data gave the Post some insight into what readers were interested in and how the Post’s World Cup coverage could try and stand out from the competition. According to the survey, readers were most interested in information to help them better understand what’s going on in the tournament and why it matters, but also highly practical information such as how and when to watch the games. Survey respondents also overwhelmingly said they were interested in stories about what was happening off the field and all the political implications of the tournament. 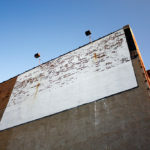 “The World Cup has a lot of magic and a lot of allure, and we wanted to make sure we could approach it from a wide lens that wasn’t just sports,” Muggeridge said. Once the Post decided to move forward with the World Cup newsletter there were lots of formats it could have taken, but by listening to its readers and incorporating their feedback, the Post was able to craft a product that it thinks will appeal to as many readers as possible. News organizations should always put the reader at the center of their work, and it’s sensible to have reader feedback help shape product plans and coverage decisions. • Pick the right author: The reader feedback also helped the Post choose Wilson to write the newsletter. In addition to his background as a foreign correspondent and former White House reporter, Wilson is a huge soccer fan. He seemed uniquely able to blend the geopolitical and soccer angles that readers were interested in, Muggeridge said. But the newsletter team also needed Wilson and his editors to commit to the newsletter. For the first couple weeks of the tournament, the newsletter will be sent out seven days a week, and putting together a newsletter is no small task. This will be Wilson’s primary coverage area for the next month. If you’re thinking about launching a pop-up newsletter, or any type of project really, it’s critical to make sure you have the right journalist anchoring the project. 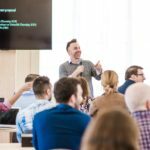 But beyond that, it’s important to make sure you have buy-in from the necessary constituencies and also that they will have the amount of time and resources to appropriately dedicate to a project. • Learn from previous projects: The Post also published a pop-up newsletter during the Winter Olympics earlier this year, and the success of that project influenced how the paper approached the World Cup newsletter. The Post sent out that newsletter in the morning U.S. time. It recapped everything that had happened overnight, offered readers a viewer’s guide to that day’s action, and also linked to other coverage. The Olympics newsletter also helped illustrate the commitment needed from whoever would end up writing it. The Post ultimately decided that it wanted someone based in the United States, not on-the-ground in Russia, to anchor the newsletter because of the level of work that would be needed to put it together each day. • Move fast: Within 48 hours of posting the survey, 90 percent of eventual respondents had taken it. The Post received a lot of feedback very quickly, but that enabled it to make a decision about how to proceed and then execute the plan. The Post had a limited time to get the newsletter ready and it had a hard deadline for when it needed to launch — the World Cup was going to start on June 14 whether the newsletter was ready or not. By quickly digesting and analyzing the survey results it was able to get moving on the project. Newsorgs traditionally have taken a long time to create and launch new products. But by moving fast and getting things to market quickly, publishers can try things out, incorporate reader feedback, and be more timely. The Post will publish the World Cup newsletter through the final match on July 15. Once the tournament is over, the Post’s goal is to get readers to sign up for some of its other existing newsletter products, and ultimately become paying subscribers. It also sees this newsletter as a way to reach a new audience of readers from outside the United States. At the end of the World Cup, Muggeridge said the Post will be very clear and transparent about having users opt-in to other newsletters. But it hopes that readers are happy enough with the World Cup product that they’ll be willing to stick around for the other offerings. Wilson is asking for feedback from readers on Twitter and over email throughout the tournament, and Muggeridge said the Post will likely run a post-mortem survey through its research department to get more formal comments and criticism from readers as well. Ultimately, the Post hopes to learn from this experience and will use it to plan and grow other products. “We’ll try this again if we have anything that feels really out there,” Muggeridge said. • The New York Times also has a pop-up World Cup newsletter. Here’s Digiday with more on that newsletter and the Times’ broader approach to pop-ups. • These are the 10 questions McClatchy staffers need to answer before they can launch a newsletter. • Want to know more about newsletter strategy? There are a lot of resources on the American Press Institute’s Better News Hub. Is your news org doing anything cool with newsletters? Who are you rooting for in the World Cup? Have any good story ideas? Send me an email, I’m at [email protected]. Photo of official World Cup ball used under a Creative Commons license.